Find ways to use different parts of your body to pull the hammock down toward the floor, to enhance the sense of grounding. For example, when in a warrior pose with the leg suspended in the hammock, really pull that leg down toward the floor. You will be amazed at how grounded this makes you feel! Explore the similarities and differences between aerial postures and their floor equivalents throughout your practice. Notice what aspects of each posture the hammock enhances, or challenges. Use the actual floor to provide relief and balance after hanging or inverting in the hammock. Be aware of where you are in space when using the hammock. If you position yourself directly underneath the rig point, the upward pull will feel very different then if you position yourself in front of, behind, or to the side of the rig point. Be aware of your dimensions and use them to enhance your alignment in each posture. Do not overdue the inversions, and be sure to balance them out with grounded and right-side up postures. Many people think of aerial yoga as an inversion-heavy practice, but it does not need to be. In fact, it is possible to practice aerial yoga without any inversions at all if that’s your wish! End your practice by taking a few moments to be on the floor. Of course you can take final relaxation inside the hammock if you like, but when you come out take a little time to either sit, lie, or stand on the floor and really feel your connection to it. Take a few deep breaths to cement in the new feelings you experienced by using the aerial yoga hammock. Remember that just because something can be done with the hammock, does not necessarily mean it will be useful for yoga. 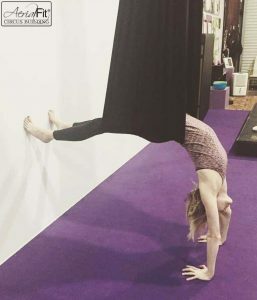 As someone who also teaches and performs aerial hammock acrobatics, I can tell you that there are many things I do with the hammock for acrobatics that I would never include in an aerial yoga session or class. Use the hammock in ways that will enhance yogic alignment and breath. Find your center! In aerial yoga we are often grounding from our core. This includes pulling energy into the core of the body to counteract the outward pull of the hammock, breathing from as deep as we can, and sometimes squeezing into the midline as the hammock tries to pull us away in all directions. For every action there is an equal and opposite reaction, and when using an inherently unstable/floating prop, we have the opportunity to become even more stable and grounded as a result. Enjoy your time in the hammock, but remember that it is simply a (very fun) prop to help you experience how each posture should feel in yoga. The more you learn to translate that to your ground practice, the more you will benefit from aerial yoga! Happy flying (and stay grounded)! 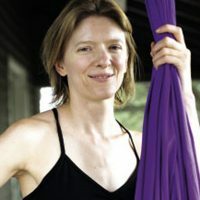 Jordan Anderson has been teaching Unnata® Aerial Yoga since 2009, she is an Unnata Aerial Yoga Course Leader, and co-founder and director of Aerial Fit®. Jordan looks to yoga teachers such as Doug Keller for inspiration on grounding and anatomy, Andrey Lappa for energy bodies and Dharma Mittra for kindness.